Speakers from Nashville’s non-profit literary center expound on the value of the written word. Co-founders Susannah Felts and Katie McDougall of The Porch Writer’s Collective — Nashville’s non-profit literary center – interpreted their views on the written word. Though language takes many forms (paintings, photos, computer code, facial expressions), they are all used to communicate and McDougall and Felts demonstrated the value of language not just as a tool for communication, but as an artistic tool of expression and exploration. Those who practice writing not only sharpen their skills as thinkers, but are more empathetic as people. At the Porch Collective they offer education, events, and outreach to encourage and enliven the Nashville literary community. More inspiring Creative Mornings Nashville talks at https://creativemornings.com/cities/nsh. 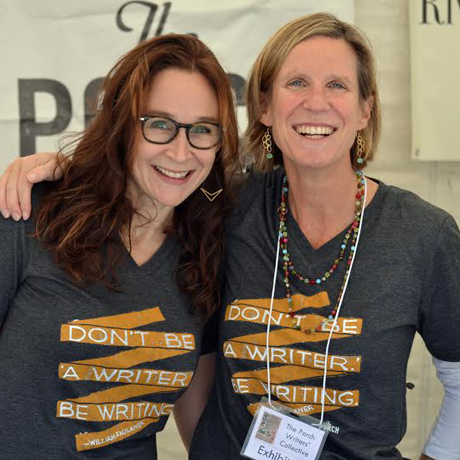 Susannah Felts & Katie McDougall inspire, educate, and connect writers of all ages through classes, youth outreach programs, and innovative events. In the process, they hope to nourish and energize Nashville’s literary community, encouraging collaboration and creative mingling between writers and other artists and makers. They believe that people in these parts have amazing stories to share, and they aim to help that happen.